I, on the other hand, am mildly obsessed with rhubarb. And when it’s in season, I’ll be the first to admit that I go slightly… crazy. Sam claims a person can only have so much rhubarb. I beg to differ. So until he leaves the dark side and comes to his senses, I’m going to spend the spring perfecting my favorite rhubarb recipes. Like, rhubarb custard pie. In jars. Because, everyone likes food in cute little jars, right? Yup. Although I’ve been in Portland for many years now, I still geek out when the seasons change. It’s just not the same in Hawaii. 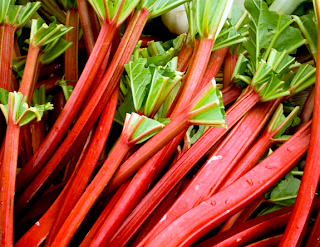 I love rhubarb because it’s the first sign that Spring is in full bloom and summer is around the corner. That time of year where the days are getting longer, and we’re finally seeing as much sunshine as we are rain. The trees are green again and birds are chirping and everything just smells good (tell me you’ve noticed the smell?!). Maybe this will be the rhubarb dish that changes his mind. If not, I will likely be eating all 6 jars. I’m just being honest. Happy rhubarb season! Preheat oven to 425 degrees. Beat eggs slightly and then add milk. In a separate bowl, mix together sugar and flour, then add to egg mixture. 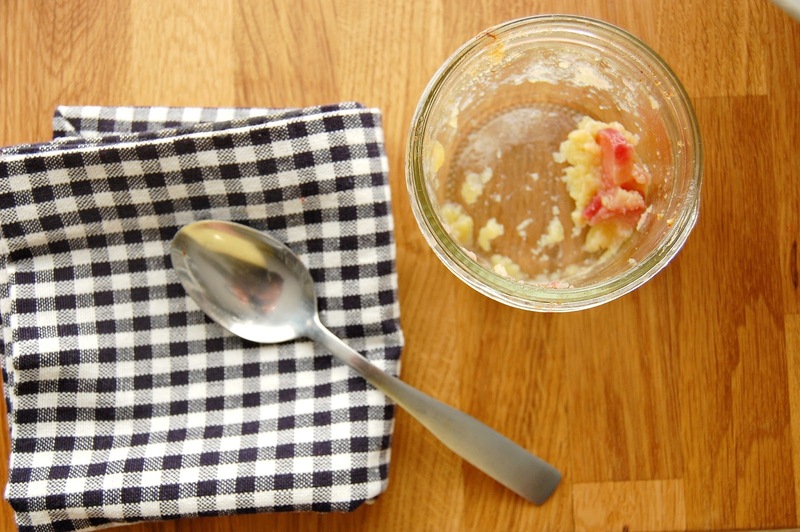 Stir in rhubarb and scoop into glass jars (not exceeding 3/4 full as mixture expands when baking). Mix crumble ingredients together with your fingers until mixture gets chunky. Divide mixture on top of pie filling, and place jars on a baking sheet. Bake for approximately 45 minutes or until bubbling. Please be careful when removing jars from oven. They will be hot! Let cool before screwing lid onto jars. Well, I did it. I successfully ventured beyond my rhubarb pie rut. 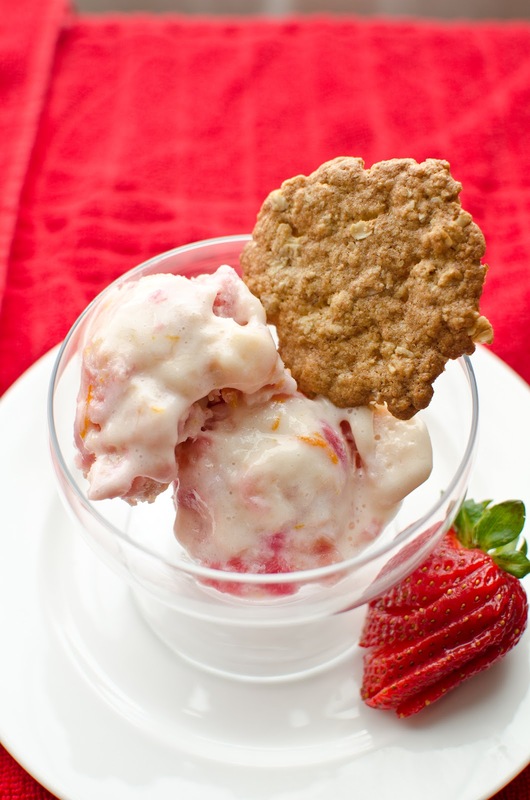 On a recent warm Portland day (and yes, we do occasionally get these), I made Sam and I a very cool treat: Rhubarb Frozen Yogurt garnished with a homemade oatmeal wafer cookie. I’m a sucker for all things seasonal. Fresh, locally-grown berries and tomatoes taste so real compared to their counterparts found in the grocery store, grown out of season and shipped in from Timbuktu. We’re currently in the middle of rhubarb season, and naturally I’ve come home from the farmer’s market with stalks and stalks of rhubarb. 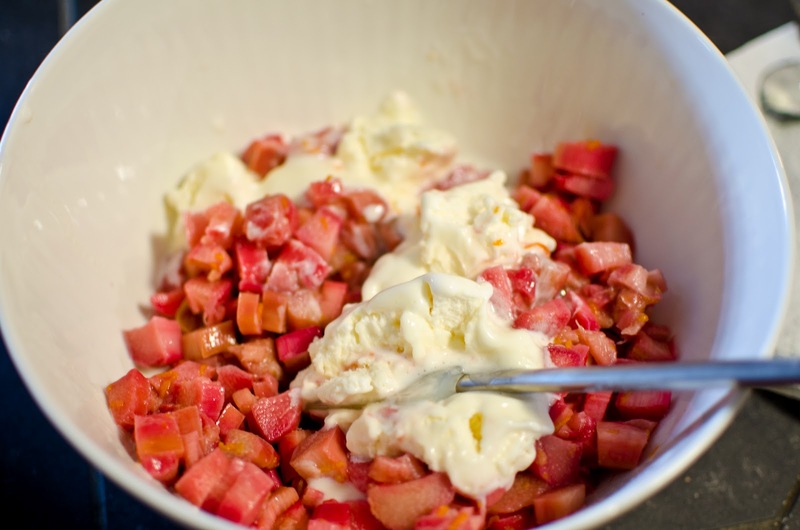 My go-to rhubarb dish is pie, but this season, I’m looking to spice it up. Let’s just say that Sam is a little bit sick of it. 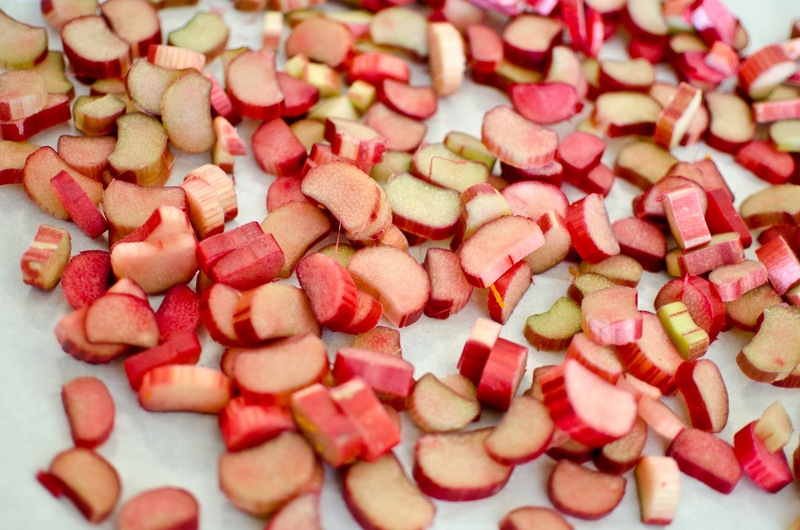 So, in the interest of being a good wife and not driving my husband into rhubarb madness, I’ve collected a roundup of delicious-looking rhubarb recipes to help our marriage survive the Spring. Do you have a tried-and-true rhubarb recipe? I’d love to hear it!